Here is some cool YouTube footage of the Art Ensemble of Chicago with Cecil Taylor. 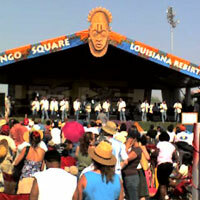 I had a very busy, but fun and fulfilling first weekend of Jazz Fest. It really started on Thursday night with The Thing at the Big Top. This band really must be heard. The music is hard to describe (isn’t most good music hard to describe verbally? 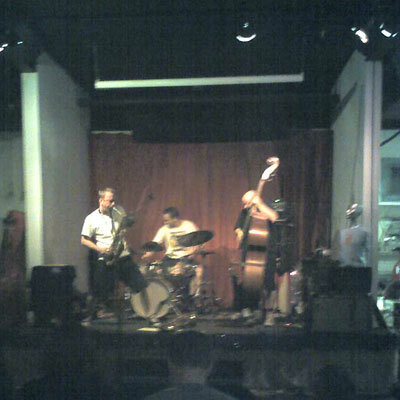 ), but as I told a friend who missed the show, it is like speed metal free jazz with good taste. There is definitely a noise element there, but there were also beautiful melodies and precise ensemble playing. It was a great way to start the weekend of music. Later Thursday night, I played with George Porter Jr and the Runnin Pardners at Southport Hall. We did a bunch of stuff from the new CD, and it was lots of fun. George said he feels like this is his best CD yet, and I am proud to have been a small part of it. I was at the Fairgrounds most of the day Friday. First thing I heard was a little bit of the Xavier University Jazz Band. I teach trombone at Xavier, and it was nice to hear the band sounding so good. Next stop was the Jazz Tent for the Rob Wagner Trio. The sound was very good, due in part to Rob (or maybe Ben) being smart enough to bring their own sound guy (Mark Bingham in this case). The poor fest engineers have a lot asked of them and most of them do a good job, but nothing beats having an engineer that is good AND really knows you and your music. Rob’s set was very good. I dig his melodic sense in that setting. From there I headed over to the Accura Stage to perform with George Porter. It is quite a view from the stage to look up and not be able to see the end of the people. I had a blast playing with George (I always do). We had the “every member of the pool” horn section on the gig with Tracy Griffin, Alonzo Bowens, Brian Graber, Mark Mullins and me. I spent many a night in college listening to this band with those guys playing in the horn section, so it is a real honor, and a little bit of a trip, to now be a part of that band. The rest of Friday included hearing parts of sets from Dr. John (which was fabulous), Astral Project, the James Carter Organ Trio, and Bonerama. It was all good. Friday night I played with Luther Kent and Trickbag and got some hard blowing blues added to the weekend’s musical mix. I didn’t get to the fest on Saturday, but had a great day on Sunday. It started with hearing an ensemble from Julliard that featured trombonist Marshall Gilkes and New Orleans natives Jonathan Batiste and Victor Goines. I only caught a couple of tunes, but it was very happening. Next I played with Vivaz. We had a fun set, and the crowd seemed to dig it. I then hurried over to the Jazz tent to catch as much of Kidd Jordan as I could. He had Alvin Fielder, Joel Futterman, Clyde Kerr, Kent Jordan, and Maynard Chatter, Jr. on the set. It was good, but it is sometimes hard to come in on the middle of a free jazz set and get the flow of what has been happening. The big festival setting also lacks the intimacy that can make that type of listening so rewarding. But, even with the difficulties, it is always good to hear Kidd. I was on my way to hear the New Orleans Social Club, when I was sidetracked by running into Lolet Boutte. Lolet is the mother of Tricia “Sista Teedy” Boutte, and used to manage Teedy’s reggae band Cool Riddims, which I played in in the late 90’s. Lolet has been displaced to Houston, and it was a real joy to run into her and get to visit for a while. She told me that Teedy was getting ready to go on stage with Bob French at the Economy Hall tent, so of course I had to go see her as well. The Boutte’s had been on my mind lately, so it was a real blessing to see them. I did finally catch some of the New Orleans Social Club, as well as a bit of The Revealers, Dr. Lonnie Smith (who had a fabulous sounding Peter Bernstein in his band), and the New Orleans Jazz Orchestra. The find of the day however was Banda el Recodo. I saw their three huge tour busses emblazoned with their logos when they arrived earlier in the day. Fortunately Ben Lyons prodded me to go check them out. Imagine if you put Herb Alpert and the Tijuana Brass, the Jackson 5, and the Rebirth Brass Band in a blender. Add a touch of Ricky Martin and the LSU Tiger Marching band. That would get close to the vibe of these guys. The first thing you notice are the matching intricately decorated blazers and the slick choreography. Then you realize that there are 4 clarinets. It isn’t until later that I noticed that what I though was a stringed instrument of some sort playing the upbeats was actually two alto horns. These guys were so tight I couldn’t hear that it was two people, I had to see that it was too people. The sousaphonist was astounding. It was quite a show. 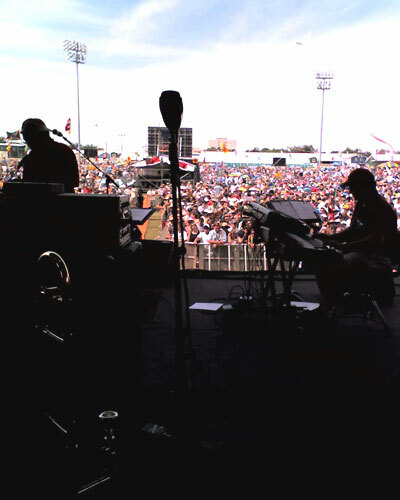 The highlight of the weekend however was playing with Bonnie Raitt to close out the Gentilly Stage on Sunday evening. A horn section made up of Tracy Griffin, Alonzo Bowens, Reggie Murray and me joined Bonnie and her band for a medley of New Orleans classics to close her set. Ivan Neville was also sitting in at that point, and when Irma Thomas walked out during “I Know”, the crowd went nuts. Bonnie’s band is great. It is always inspiring to hear the tops of the professional music world, and these guys are the tops. They are clean and precise and deeply soulful all at the same time. What a treat. And what a great weekend. Of course, when your weekend ends with a kiss on the cheek from Bonnie Raitt, that’s usually a sign of a good weekend. I like capitalism. I like the idea that businesses that provide good products/services, and good customer service can do well. If I get bad service, I tend not to make a big stink, I just spend my money elsewhere in the future. The way mobile phone businesses operate in the US makes that very difficult. We are forced to pay huge extortion fees to get out of contacts when we are displeased with the service that is provided through that contract. As I just found out, some companies even tax us on those extortion fees. I had a contract with Nextel (Sprint). There were two phones, each with their own number, sharing a pool of minutes. My stepson lost his phone. I asked to have the number disconnected. I figured since we didn’t pay any extra to have his ohone on the plan, and this change would have zero effect on the sizeable amount of money that I was paying to Sprint/Nextel every month, that it shouldn’t be a problem. I was told that it would cost $200 to disconnect that line. When I explained that they would not be losing business, I was told that it didn’t matter. While this news did not make me happy, the way it was delivered made me livid. The attitude that came from the person on the Nextel end of the phone was essentially “What are you gonna do? You can’t leave it will cost you $400 to get out of two lines.” Now that was never said, but that’s the vibe I got. Never once was I told that they were sorry that they couldn’t do what I wanted. I was never given any sort of reason why they couldn’t do what I wanted. The fact that I was unhappy seemed to not phase them at all. That was my real problem with the conversation. Not that I didn’t get what I wanted, but that they didn’t care if I got what I wanted. Now this is a no win situation for me and a no lose situation for them. My choices are: to keep doing business with a company that I have now determined cares more about getting as much of my money as possible than fulfilling my needs as a customer, or to pay the extortion fees to get out of my contract. They can’t lose. They either keep getting their high monthly charges or get the extortion fees. I decided to pay the extortion fees and switch carriers. Nextel wouldn’t turn off my service when I asked them to, I had to pay for the rest of the month, so that added close to $100 to the extortion fees. Today I got the bill for the extortion fees, and it included TAXES and FEES on the extortion fee. I called to complain and was told that any charge that went through their system is charged the sales tax and Universal Service Fees, and it couldn’t be changed. (Read: screw you, you have to pay us, the lawyer or fight with the credit bureau isn’t worth the $500 we will eventually screw you out of before you can be rid of our bad service.) So no one actually said that, but that was the message, and he was right. The $23 in taxes and fees tagged on to the $400 in I-don’t-like-your-service-and-want-to-end-my-contract extortion fees, which were tagged on the to three weeks of service I had to pay for after I asked the service to be turned off, all cost less that the hassle of fighting to restore my credit after I don’t pay the bill. So again, I can’t win and they can’t lose. They can provide subpar service, and all I can do is pay the extortion and move on, hoping for better results elsewhere. But at least I can also tell my side of the story. My first exposure to Hill’s music was instigated by a comment from Ed Petersen. I was taking composition lessons from Ed and he told me a piece I wrote sounded like something with an Andrew Hill vibe. I wasn’t very familiar with Andrew Hill’s music, so I bought Point of Departure. I liked it and more albums followed. I don’t know that I have written anything else reminiscent of Hill’s writing, but I sure have enjoyed listening to his music. This article is really about comedy improv, but it quite interesting in its anaylsis of what makes improvisation work. My response wasn’t particularly witty, but it laid the groundwork for a scene that quickly became very funny as she went to greater and greater lengths to convince my character of her devotion. Through agreement and elaboration, improvisational performers invent relationships, emotional stakes, and dramatic and funny scenes out of nothing but their own teamwork. How do you explain to your 6 year old daughter that one of her classmates has been shot and killed by his own father? What is wrong with our society? We need to be better people to each other. We need more peace in our own lives, so we can encourage peace in our fellow humans’ lives. We need to support and love each other. Not just our families and friends, but the freaks and the weirdos and the people that we don’t understand, and the people that scare us. Those are especially the people we need to love and support. Please pray for all of us to be able to treat ourselves and each other with respect and dignity and love. If you don’t pray, chant or meditate or play long tones, or do whatever it is you do. Our world, and our childrens’ world depends on it. I want to write a post on Ed Neumeister‘s Artist Share projects, and I am not sure if I should start with Ed or the Artist Share concept. Each subject warrants many words. I’ll start with Ed. My first exposure to Ed was through my favorite big band of my early adulthood, The Mel Lewis Jazz Orchestra. The guys in that band were my heros. Real working NY pros. In the late summer of 1990, I was in NY for a week visiting my friend Andy, who lived on Long Island when not rooming with me in New Orleans. I heard Ed in a quartet at Visione’s one night, then a few nights later with Mel’s band at the Vanguard. (I don’t think they had yet gone to the Vanguard J.O. name, even though Mel had passed away earlier that year.) That night at the Vanguard I asked Ed if he was available for a lesson. The next day I took the train to the town he lived in (Croton-on-Hudson as I recall), and Ed picked me up at the train station and took me to his house, where I got way more than an hour’s worth of a lesson. We dealt mostly with practice routine. This was Ed’s suggestion. He said if we would have been in a situation where the lessons would be recurring that he could be more specific, but since this was a one shot, we would cover the most important stuff, which is organizing and focusing your practice. We also hit some improv stuff and I asked lots of general kind of “how do you make it in NY” type questions. Ed was honest and sincere, and very helpful and encouraging. That lesson still shapes the way I practice and teach. I never did move to NY. It has worked out ok for me so far. In recent years I have become fascinated with trying to discern business models that will work for modern creative artists. 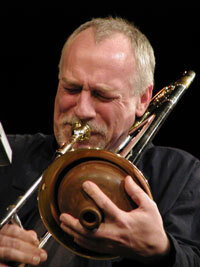 In an recent internet forum discussion of piracy and DRM, my good friend trombonist David Gibson made the point that fans that feel like they can develop a relationship with the artist are less likely to pirate that artist’s recording, because there is a face associated with it, not just a record label monolith. This is the basis of the Artist Share model. Taking advantage of internet capabilities to allow the listener to see and experience aspects of the artist and the artist’s process that can be experienced from a CD and its accompanying liner notes. When you buy in, you become a participant, and the different packages are called participant offers. I have become a participant on a few offers. The most basic level is pretty much like buying the CD. You get the CD in the mail, and access to some online goodies, and it costs about the same as buying a CD in an expensive national chain store, but you get the goodies too. I bought Ed’s Reflections CD this way, and also bought a couple of Ingrid Jensen Artist Share CDs at a live performance, and they came with a code to enter to enroll in the participant stuff online. It is a pretty slick system. The participant content ranges from lead sheets and podcasts to video commentary and recording session footage. Ed has some very frank discussion of his career and motivations on one of his audio conversations. It is quite insightful. One possible drawback to the Artist Share system is that sometimes the amount of stuff can be overwhelming. Some of it is streamable only, so it ties you to your computer, and I don’t always have the time to fully explore everything that is available. I guess too much of a good thing is still good. To wander off path for a minute, I wonder how appealing Artist Share is to non-musicians. I think all of this inside info is great, but does Joe Blow jazz fan care about a leadsheet to the tunes on the CD? Is there a Joe Blow jazz fan that isn’t a musician? Can we survive with only other musicians as our audience? Are we already doing that? Sorry, I’ll try to get back on track. 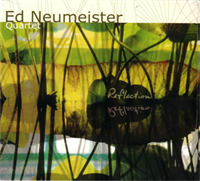 Ed’s newest project is called the NeuHat Ensemble. I was sent a recording of this group from the most recent IAJE conference. This is a very interesting group. Ed composes the music and conducts, but doesn’t play trombone. It is kind of a big band with strings and more interesting woodwinds, but that description is too simplistic. Jazz is definitely the foundation of the music, but there are lots of shapes and colors that come from other areas. Improvisation is prevalent, and the improvisers are good. The studio CD should be great. It is being made possible through Artist Share participation. There are some very cool participant offers, including composition or improvisation correspondence lessons. Go here to see all the offers. A follow up to the earlier King Bolden’s shut down story. A fascinating Washington Post story on world famous violinist Joshua Bell busking for an hour in a DC metro station. It is long, but worth the read. I tend to agree with the Kantian interpretation, that the results were as much about context as taste…at least hope that is the case. 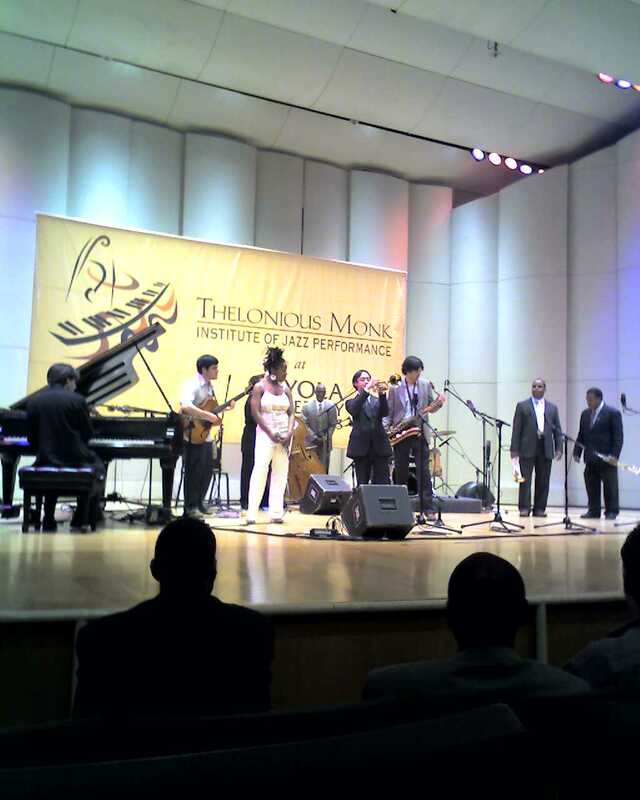 Today I had the pleasure of attending the standing ovation fest that was the Announcement of the Thelonious Monk Institute of Jazz relocation of its college level program to Loyola University New Orleans. As an alum of Loyola, this good news for me, because my degree’s value just increased noticeably due to my alma mater having a cool new roommate. As an adjunct faculty member at Loyola this greatly increases my chances of running into Herbie Hancock or Wayne Shorter in the cafeteria…or maybe it doesn’t. 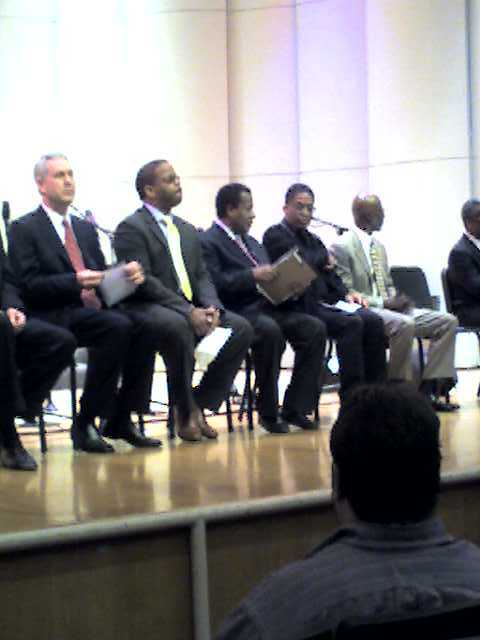 The whole ceremony was positive and it gave me a new ray of hope for New Orleans. Hopefully we can stay in this positive light. My apologies for the crummy camera phone pics.